There is alot to see and do while in Cape Town and if your time is limited, it is a good idea to plan a rough itinerary in order to make the most of your stay. If you plan well, you can look forward to a bumper visit, whether it be 3-days or 3-weeks. DAY ONE: Start off on your first day by orientating yourself with a trip around the Cape Peninsula. Follow the False Bay coastline via Kalk Bay, Fish Hoek and Simon's Town and stop at Cape Point. Continue via Scarborough and Kommetjie and then follow Ou Kaapse Weg past Silvermine and down into the Constantia Valley. In the afternoon, head for Hout Bay and stop-off at the harbour for fresh fish and chips or a boat trip to the seal colony at Duiker Island. Continue your peninsula tour via Llandudno to Camp's Bay and take a walk on the beach or enjoy a cocktail at one of the many beachfront bars and cafe's. DAY TWO: Go wine tasting in Stellenbosch and Franschhoek. There are an abundance of wine estates to visit, so collect a wine route map from a toursim office or decide where to stop as you go along. Both areas have excellent wine routes that are well sign-posted and easy to find. Enjoy a leisurely lunch at one of the wine estate restaurants or stop-off in Franschhoek's main street for a selection of quaint cafe's and bistros. Both areas are worth visiting, and although there is a fair amount of driving involved the scenery along the way is spectacular. Alternatively, stay closer to home and visit the Constantia wine estates in either the morning or afternoon - this will give you time to visit the beautiful Kirstenbosch National Botanical Gardens. DAY THREE: Take the ferry to Robben Island for a glimpse into the political history of South Africa. The trip includes a tour around the island and a tour through the prison - led by a previous inmate (note: book in advance). On your return, spend a few hours shopping at the V&A Waterfront with its wide selection of boutiques and markets, cafe's and restaurants. In the late afternoon, take the cablecar to the top of Table Mountain for a birds eye view of the city and the harbour. DAY ONE: Start off on your first day by orientating yourself with a trip around the Cape Peninsula. Follow the False Bay coastline via Kalk Bay, Fish Hoek and Simon's Town. Stop off at the penguin colony at Boulder's Beach and then continue to the Cape Peninsula National Park and Cape Point. Within the reserve you will see a wide range of indigenous fynbos as well as baboons, buck and Cape Mountain Zebra. Take a photo at the most southwestern tip of Africa and admire the views from the cliff tops at the old Lighthouse. DAY TWO: Take the cablecar to the top of Table Mountain for a birds eye view of the city and the harbour as well as the Atlantic Seaboard beaches. Visit Greenmarket Square in the city centre for some African art, jewellery and clothing and then spend the afternoon soaking up the sun at either Camp's Bay or Clifton beach. 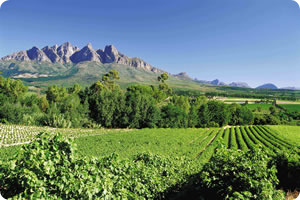 No trip to Cape Town is complete without a visit to the beautiful winelands. DAY THREE: Go wine tasting in Stellenbosch and Franschhoek. There are an abundance of wine estates to visit, so collect a wine route map from a toursim office or decide where to stop as you go along. Both areas have excellent wine routes that are well sign-posted and easy to find. Enjoy a leisurely lunch at one of the wine estate restaurants or stop-off in Franschhoek's main street for a selection of quaint cafe's and bistros. Both areas are worth visiting, and although there is a fair amount of driving involved the scenery along the way is spectacular. 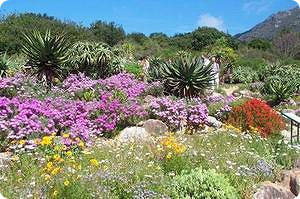 DAY FOUR: Go to Kirstenbosch National Botanical Gardens and enjoy either a leisurely stroll or a more strenuous hike. The gardens are a showcase of South African flora with meandering pathways, small streams and spectacular views from the upper slopes. Then, go on an organised township tour and experience for yourself the vibrancy and spirit of the African people. DAY FIVE: Take the ferry to Robben Island and visit the prison that was home to Nelson Mandela as well as many other political prisoners. The trip also includes a tour around the island with its spectacular views back towards Table Mountain. Then spend the afternoon at the V&A Waterfront with its shops, craft markets and many restaurants and cafe's. You could also visit the Two Oceans Aquarium. Seven days or more in Cape Town gives you the opportunity for a leisurely holiday and means you can spend at least one or two days relaxing at your choice of Cape Town's beautiful beaches. Do something adventurous such as joining a mountain biking day-trip, go horseriding in Constantia or Noordhoek or take a scenic helicopter trip. For golf enthusiasts, there'll be plenty of time to try out a few of Cape Town's exellent golf courses and if you enjoy the outdoors there are many popular walking and hiking routes in the surrounding forests and mountains. If you are a shopping fan, visit Kalk Bay or Hout Bay for quaint main street shops from art to decor or shop till you drop for clothing, accessories and much more at the V&A Waterfront, Canal Walk or Cavendish Square. > Remember, some activities are weather dependent so allow yourself some flexibility. > In summer it is light until about 7:30pm - and many tourist attractions stay open later than usual. > Try and alternate very active days with more relaxed days. After a full day of sight-seeing and walking, it would be a good idea to plan a trip to the beach for the following day. > To give yourself a break from planning, driving and navigating, join a tour group for a day or two. You'll be able to sit back and relax and enjoy the added insight of an experienced guide.